Please contact us with either a call to our office or by choosing the Service Hotline button below. The Greenfield Group is committed to providing healthcare professionals with well planned, practical and cost effective business solutions for their medical real estate needs. Exclusively focused on the healthcare industry for over 20 years, The Greenfield Group has the experience and expertise needed to deliver the most comprehensive services available. We understand the intricacies of the ever-changing healthcare environment and take pride in our ability to structure projects to meet a wide range of goals for our clients. The Greenfield Group achieves success in every project by employing various development solutions along with property management, brokerage, and leasing. 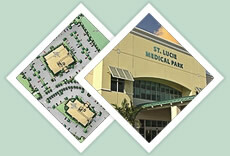 Our project résumé includes over two million square feet of medical facility development and management. We have developed and currently manage facilities containing surgery centers, diagnostic centers, women’s centers, vascular labs, wellness centers and rehabilitation services in addition to all classes of medical office space. This diverse experience has enabled our company to develop unique processes and procedures, which deliver a costeffective and specialized end product.